Translation from Dados – Revista de Ciências Sociais, v. 52, n. 2, 2009, pp. 335-376. The article contends that Euroscepticism is a fundamental variable for a good understanding of the support for new extreme right-wing party platforms in national elections among all Western European countries. Based on voting data for parties aligned with the new far right in European national elections, the article maps the growth of extreme right parties and tests the correlation between the support for intolerance and variables pertaining to economic and social issues, perceptions, and representations. The findings provide empirical evidence to confirm that the preference for intolerance is not based on material or economic dissatisfaction, since identity is the main focus of concerns and claims in the new political cleavage that supports the new extreme right. Dans cet article, on affirme que l'attitude euro-sceptique est une variable fondamentale pour la réflexion sur la préférence que les électeurs européens occidentaux montrent envers des programmes de partis d'extrême droite lors de leurs élections nationales. À partir des données recueillies concernant les votes en faveur des partis qui suivent la nouvelle idéologie d'extrême droite lors des élections nationales européennes, on dresse la carte de la croissance des partis d'extrême droite sur ce continent et on pose la corrélation entre le soutien donné à l'intolérance, d'une part, et les variables économiques et sociales, de perception et de représentation, de l'autre. Les résultats viennent confirmer empiriquement que la préférence pour l'intolérance ne se fonde pas sur des insatisfactions de nature matérielle et économique, puisque la principale source d'inquiétude et de revendications issue du nouveau clivage politique sur lequel s'appuie la nouvelle extrême droite c'est l'identité. One of the consequences of the European Union (EU) and its complex Eurobureaucracy was the internalization of relationships between countries formerly managed according to the dynamics of international diplomacy. Thus, initiatives of cooperation or conflict resolution previously settled in the realm of foreign relations among European states are now being negotiated in Council of Ministers or the European Parliament. Regional institutions are new actors as well in the national politics of European countries involved in the process of integration. In the context of a highly complex political process, as is the European case, the aftershocks of regional politics are reflected in voter preferences in national elections. It follows that the ideological profile of political parties and how they position themselves with regard to issues related to regional politics are taken into consideration not only in European elections but in domestic elections in EU member countries as well. The perception of a shift as to the negotiating and decision-making arenas in the dynamics of European politics entails consequences in the strategic calculations of electoral preferences made by political parties in all realms of electoral competition. Given this new scenario, local and national elections must also be observed in order to determine the success of party agendas that are clearly favorable or contrary to the process of political integration. The hypothesis this article develops is that support for Europe's new extreme right is heavily reliant upon opposition to the process of integration and the deepening of policies and rules which includes citizens of different nationalities in a single category of European citizens. Thus the varying performances of political parties radically opposed to the EU must be understood in the context of the development of regional integration, taking into account aspects which influence the behavior of voters that go beyond the perceived economical benefits brought about by integration. European voters are well aware that the actions of their chiefs of state and ministers are no longer restricted within the realm of domestic politics. By the same token, their autonomy to implement policies has ceased to be absolute, for now Euro-policies and regional interests create restraints. This is because regional European institutions are now new actors as well in the national politics of European countries involved in the integration process. Likewise, political parties have become actors representing the interests of groups who identify more or less with the project of integration and all its consequences. Indeed, the ideological profile of political parties and its positioning relative to regional subjects are taken into account not only in European elections, but in national elections as well. European integration is an inevitable subject in the agendas of European political parties and in electoral platforms in competition at all levels: local, national and European. Countless surveys have investigated the positioning of political parties with respect to integration, but little attention has been given to eventual interrelations between the positioning of political parties as to integration and their performance in local and national elections. The agendas of intolerance and xenophobia of several parties are incompatible with the regionalist European agenda. However, amidst non-systemic variation of voter preference for right-wing, center-right and center-left parties, there has been an observable comeback of the old far right wing at the core of the development of integration. These parties have been enjoying timid yet continuous increase of support from the European electorate. Some findings indicates that, contrary to what an analysis based on the political propositions and discourses of extreme right wing leaders could suggest, the presence of immigrants, violence rates or the level of economic development are not the best means to understand increased voter preference in Western European countries for parties which defend reform that is less inclusive, non pluralist and that reflect Euroscepticism. Societies who have supported ERPs consider themselves to be more well-informed about the EU, and are thus presumably more aware of the consequences of integration on domestic politics. What is more, these societies have displayed positive economic performance and levels of income distribution; and violence rates in these societies have dropped more significantly than in those that do not support ERPs. Stronger resistance to social integration has clearly been singled out in the surge of a wave of extreme right neo-populism which gained momentum in the 1980s. Those who fiercely oppose the process of integration currently are also those who sympathize with the "new extreme right" and regularly vote for ERPs. The novelty feature of right wing radicalism is anchored, essentially, according to Betz (1994), to the mutation of industrial capitalism into post-industrial capitalism. Structural economic and social transformations, according to this outlook, generated the appearance and resurgence of identity and culturally-based claims. As a result, the problem of collective identity has been acquiring new dimensions and contours in contemporary debates concerning political claims and loyalties. Different explanations attempt to describe the conditions and motivations which led the authoritarian rhetoric of the extreme right wing to undergo the profound changes which set apart the traditional right wing, notorious for its fascist bent (1945-1980), as mentioned earlier, and the new extreme right, distinguished for its support of xenophobic attitudes and the defense of anti-immigration policies after the 1980s (Ignazi, 1996; 2003; Kitschelt, 1988; 1994; 1995; Mudde, 1996; 2007; Taggart, 1998; Veuglers and Chiarini, 2002; Veuglers and Magnan, 2005). Clearly, events such as European integration, as well as globalization, simultaneously contribute towards the development of demands for non economic public policies. These currents strengthened the wave of politicization of new issues, such as immigration and identity, at the same time the call to protect values and beliefs, and the concern with subjects such as culture, sovereignty, and security started figuring prominently in the political agendas of the late twentieth century. Ignazi (1996; 2003) and Kitschelt (1995), in presenting their theories on the emergence of a new extreme-right, linked it to the great transformations of the political spectrum on certain European countries. In other words, the ERPs are identified as a byproduct of post-industrial societies and classified as "antisystemic parties" (Kitschelt, 1995; Ignazi, 1996; 2003; Poguntke and Scarrow, 1996). Marks, Wilson and Ray (2002) classified contemporary European political parties according to social divides among interests groups who support party ideological families. Furthermore, the authors of this study point out that the strategies parties adopt according to their support or resistance to European integration run along two dimensions: a political one and an economic one. Chart 1 sheds light on the fact that absolute resistance to European integration with respect to its political and social features is exclusive to ERPs. These parties are the ones preferred by voters who have become increasingly skeptical of the representative system, the party system and democratic institutions.Â Curiously, two developments were unfolding at the same time: the bolstering of the EU's integration policies (specifically, with the inception of the Single European Act, which was debated and then signed in the 1980s), which is based on the bringing down of political, social, and economic boundaries between its member states, and the consolidation of a new political ideology critical of representation, that is, the representational structures accepted by constitutional norms in effect. The new populism is buoyed by opponents of the democratic representative system who have articulated their strategies, since they regained momentum, from within the very system, as participants. In other words, this new brand of populism calls for the overturning of pluralists rights, yet without resorting to revolutionary violence or coups, and rather from within the political processes of preference building. Many scholars who have examined the extreme right have conducted important comparative political analyses taking into account a certain set of countries of comparing the strategies of extreme rightist political parties in several countries. 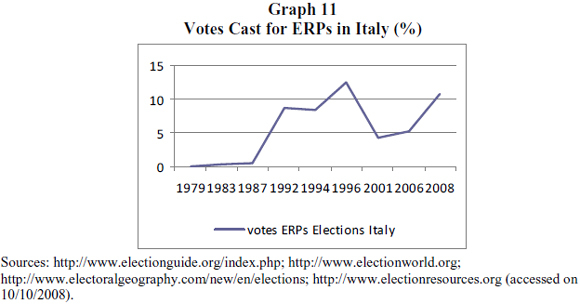 As the aim of this article consists of identifying the true increase of support for ERPs, in addition to shedding light on the motivating factors of this support, the first step was to organize data relative to all parliamentary elections, from the beginning of the 1980s until 2008, in order to gauge the increase of votes cast for ERPs, since their appearance, in the region as a whole and also in each country. 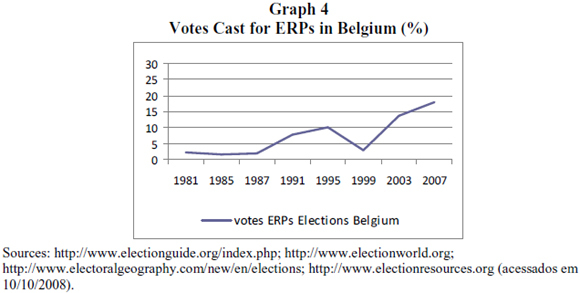 Graph 1 presents the sum of the percentages of votes cast for extreme rightist parties in countries of the EU15 with the sole aim of providing an overall picture of variations of electoral support for ERPs in national elections in Western Europe.4 The conclusion is that there is a rise in votes cast for ERPs, with eventual spikes and periods of stability. Most relevant to the arguments advanced in this article is not electoral success per se, in terms of the acquisition of seats in national parliaments, for each electoral system is different, its specific rules vary, and, in the majority, do not ensure the possibility for small parties to achieve sufficient votes to attain electoral success in national Parliaments. The main objective is to simply ascertain the fact that preference for ERPs has been rising steadily during the years being examined. 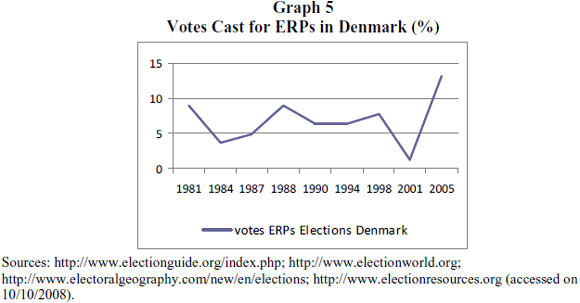 It goes without saying that this increase is not evenly spread, since, in some countries, ERPs do not receive more than 0.01% of the votes, and thus are not taken into account here. For this reason there is a distinction that must me made ahead between countries in which ERPs receive electoral support and those in which they do not. 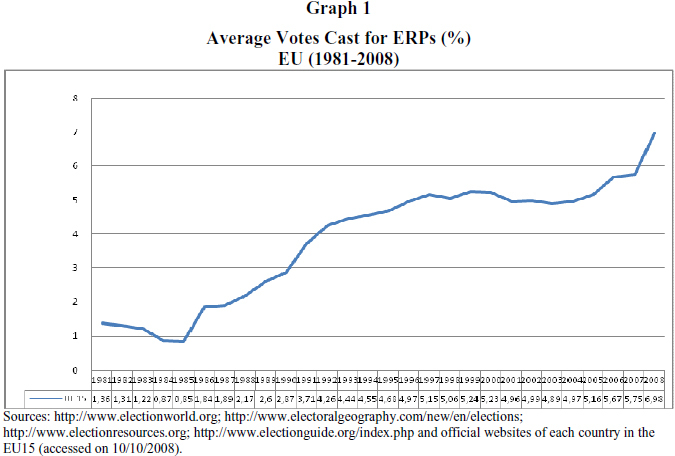 Examining the aggregate data for the entire region on Graph 1, it can be noticed the votes cast for ERPs increased from 1.36% to 6.98% when considering the EU15 and the entirety of the period starting in the 1980s which marks the appearance of "the extreme right." 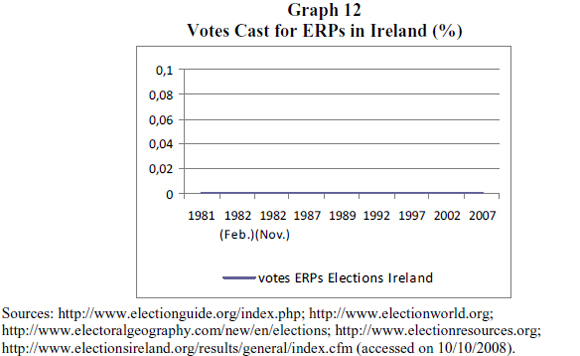 Although the first ERPs with the features described above did appear in the beginning of the1980s, it was not until 1986 that they achieved noticeable electoral results (1.84%) and not until 1995 that they achieved more significant results (4.68%). In this interim, ERPs were able to improve their organization and during the 1990s became consolidated. 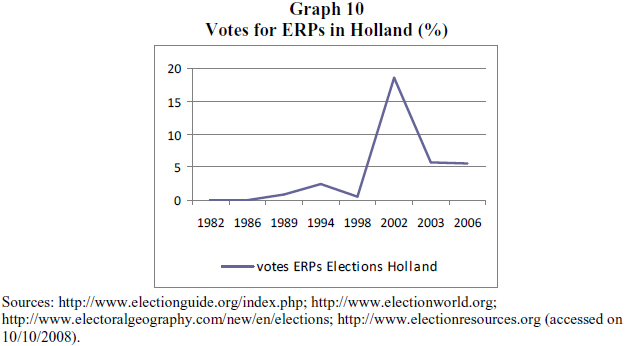 Graph 1 illustrated that, after 1995, it is possible to notice a certain degree of stabilization of electoral support for ERPs at around 5%, being that new growth initiates starting in 2004. When countries are analyzed individually, as in the graphs above which illustrate the support for ERPs by member country,5 it is possible to conclude that, indeed, growth is a reality for almost the entirety of members of the EU15. Luxembourg presents a slight 1% decrease and, in France, since the 2002 election scare, with Le Pen's victory in the first round, the National Front has struggled. A question that remains unanswered by the academic work on electoral conjunctures which compare party performances in Europe: what are the common regional motivations for voters who support xenophobic political agendas and who are against European political integration? As proven, the phenomenon of a rising extremist right is a regional one and therefore the incentives to support ERPs must not be evaluated based solely on national conjunctures. However, there is still the task of defining which variable should be considered among all attitudes or perceptions, data or indicators, for improved comprehension of the preference for defending national identity and culture at any cost. This article does not have the ambition of settling this debate, but rather to contribute by proposing variable that are usually not considered, such as those related to representation in European institutions. The members of the EU15 share similar traditions and, due to having been subjected to the same Western historical influences, their national institutions are also similar, meaning that they possess principles of constitutional organization and respect comparable international institutions. The gap that remains to be filled is explaining what there is in common between the preferences of a minority of voters who cast their ballots for political parties who represent xenophobic platforms incompatible with the constitutional and international norms which posit the need to respect differences, freedom and social rights.Â All in the name of sovereignty and identity. The year 2004 brought heightened attention and therefore more transparency to the debates concerning the Constitutional Treaty, its content and the importance of having it approved in 2005. Coincidentally, 2004 and 2005 were years in which seven countries of the EU15 held general elections. 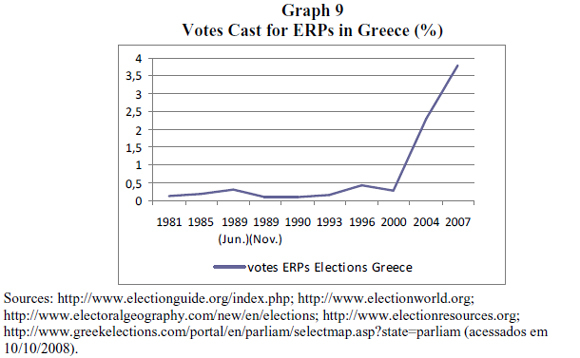 Since 2004, however, as shown in Graph 1, it is possible to identify a new surge of support for ERPs - the main political parties explicitly opposed to the Constitutional Treaty. The year 2005 was therefore chosen to test variable which will serve to verify the different reasons which led societies involved in the process of integration to have diverging electoral preferences. The xenophobic proposals made by the ERPs frequently resort to arguments for intolerance which portray the growing numbers of immigrants as the determinant of certain outcomes: increased violence, unemployment, economic performance, among other things. Differently, the normative theory which has explained the social and historical conditions for the emergence of a new political division, the outcome of a post-industrial society, highlights the subject of collective identities in studies of ideological families in the European party system (Ignazi, 1996; 2003; Kitschelt, 1995). When we conducted isolated comparative studies between some of the countries of the region, we noticed that what can explain some national causes for support for ERPs in some cases does not necessarily explain the same phenomenon in other countries. Luxembourg and Belgium, for example, greatly benefitted from integration in economic terms, and not least also became key countries for the Eurobureaucracy. Yet, its electors show strong support for ERPs. Both countries also enjoy extremely low inequality and income distribution indicators and high employment rates, furthering perplexity as to the reasons for intolerance in these countries. Conversely, Germany has been suffering the consequences of national and regional integration during the last decades, with high unemployment rates and immigration flows, for example. 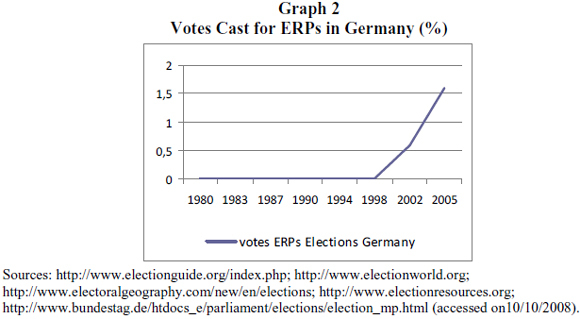 Nevertheless, the voting population in Germany shows meager support for ERPs. 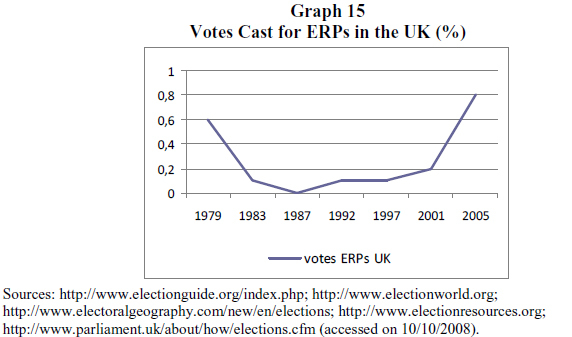 These are just a few examples which serve to justify the need to investigate common regional causes which help understand why ERPs have attracted increasing numbers of votes in Western Europe. When considering the historical trends of support and non support for ERPs in Western European countries, it is possible to notice that economic performance is not a good predictor for lack of support for ERPs. Contrasting cases, such as Ireland and Portugal - countries with no tradition of support for ERPs - can exhibit completely distinct economic growth indicators for 2007 (Ireland with highest rate, 5%, and Portugal with the lowest, 1.8%). 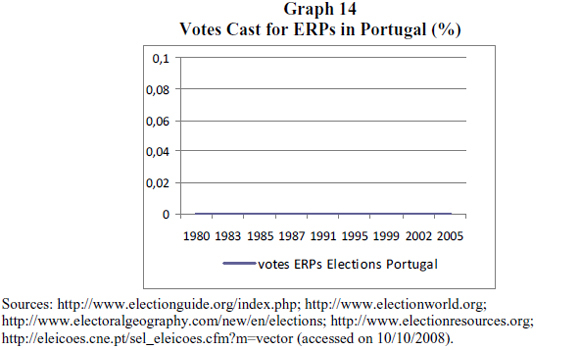 Table 1 shows the average of votes cast for ERPs on a country-to-country basis in the course of the 28 years analyzed in our research.6 As can be observed in Graphs 12 and 14 and in Table 1, both in Ireland and Portugal ERPs have not been able to organize and/or receive significant electoral support. In the case of Portugal, we have observed that the Partido Nacional Renovador (PNR) seeking electoral success only to no avail, perhaps because it represents the tradition extreme right, lacking the rightist renovation represented by the new political division upon which the new rightist radicalism is based on. 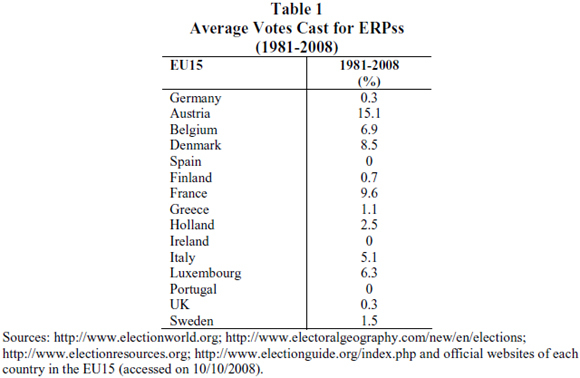 Table 1 shows all the percentage averages of votes cast for all ERPs in each one of the member countries of the EU15, from the emergence and consolidation of ERPs until the last national elections (2008). As observable, although countries such as the United Kingdom, Germany, Finland and Greece do not have a strong tradition of ERPs, they eventually see a very small minority voting for extremist agendas. In the opposite direction, Luxembourg, Belgium and Denmark, for example, have been following the same line as countries that have a tradition of supports for ERPs, such as Austria. Spain is one of the Western European countries with a stronger tradition of xenophobic groups organizing and forming networks, but the extreme right's party organization remains weak. 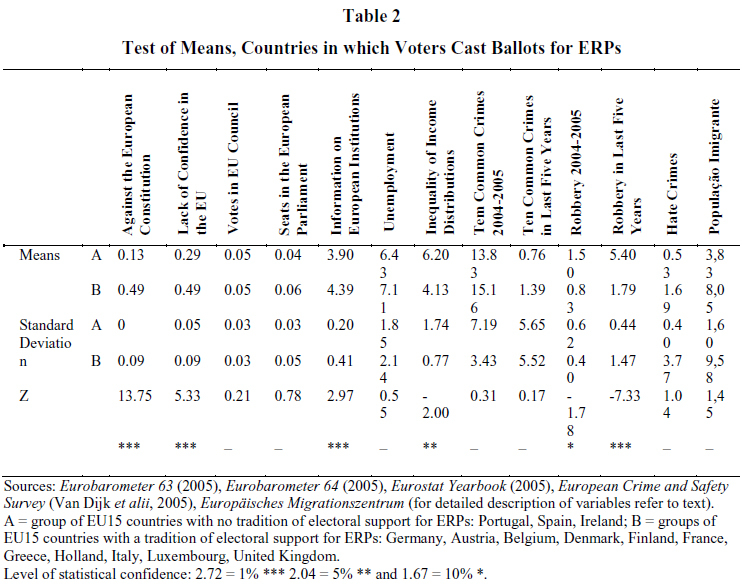 In sum Spain, Ireland and Portugal indeed do not present the conditions for the emergence of strong ERPs, since the comparison of the means of votes cast for ERPs in these three countries, since the 1980s is "0" (see Table 1). What could explain the difference in terms of motivations or fear among societies who have not absorbed Euroscepticism to any degree? With the objective of discovering the social and institutional conditions which could possibly influence electoral preferences for ERPs, we selected some variables to be correlated with support for ERPs. The final aim is to aid in understanding more accurately the relationship between economic, increased criminality rates, representational capacity and attitudes towards the EU and its reform with the eventual presence of support for ERPs. We believe that this reflection and research concerning the routes so far taken by Euroscepticism in Europe are fundamental in understanding the current crisis of the EU, in which institutional reform depends on persuading societies that integration is in the common interest and regional reform implemented thus far require social legitimization. 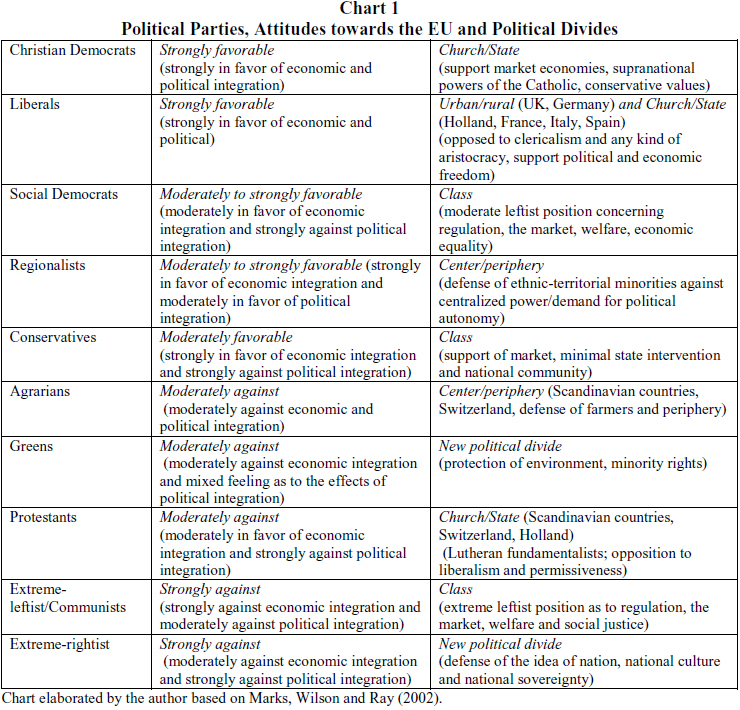 The sole source of fierce political opposition to the EU's agenda of political and social integration are the ERPs (see Table 1) and the national electoral platforms of these parties have reflected a clear and constant attitude of intolerance towards the consequences of political integration. 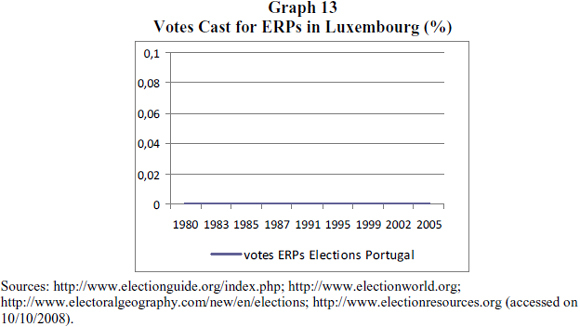 Since the increase of votes cast for EPRs is a regional phenomenon, isolated national or conjuncture-related factors taken into account in isolation are not sufficient to construct an explanation capable of accounting for the meaning of the growth of the extreme right in all of Western Europe. Two variables for institutional representation were selected for the test: the weight of votes in the Council and the number of seats in the European Parliament. This data is organized according to the percentage weight each country has in each one of these European institutions, taking into account the total votes and seats of all EU country members. The verification of the capacity of representation of countries in European institutions can be an important indicator of how much influence a given member country exerts in the European decision-making process. We expect to observe societies that have been supportive of parties who oppose integration to have less representation in the European institutions, thus furthering dissatisfaction as to the (lack of) capacity to interfere in the European decision-making process and thereby also furthering the undermining of mechanisms in place for the protection of national sovereignty and culture. The economic variables unemployment and income distribution inequality were constructed based on data from the Eurostat Yearbook (2005) and contribute towards the configuration of conditions of economic performance which directly affect voter perception, especially in relation to the existence of foreigners and immigrants who compete in the working space and other social interaction environments. The variables on violence - ten common crimes 2004-2005, that is, 2005 in relation to the year which immediately preceded it, ten common crimes in the last five years, theft 2004-2005, theft in the last five years, and, finally, hate crimes Â­- are relevant in order to verify if there is any relationship between the preference for agendas of intolerance towards immigrants and foreigners and the increase of violence. The decision to include these variables concerning social risks and victimization was prompted by the message included in the programs put forth by the ERPs, frequently appealing to the association between increased violence and a justification for an intolerant attitude towards foreigners. It is important to point out that violence decreased in the EU15 region in general, and the ten most common or frequent crimes in European countries present significant reduction in terms of their occurrence in the last years in the majority of countries surveyed. The data used for the measurement of the variables related to violence were provided by the European Crime and Safety Survey (EU ICS), published as the EU Research Report - ICS in 2004 (Van Dijk et alii, 2005). This extensive survey sought to produce estimates of victimization in order to use them in a comparative perspective, involving countries of the EU15 and the three countries from Eastern Europe (Poland, Estonia and Hungary). The ten most frequent crimes in each country were considered jointly, and the survey took into account the occurrence of one or more victimizations in the last five years (before 2005) and from 2004 to 2005, excluding theft crimes, which were treated separately. Specifically, the inclusion of hate crimes as an explaining variable had the objective of including crimes considered mostly committed against immigrants and other minorities, and hence, are crucial to the arguments here. The variable immigrant population was considered important in order to identify the presence of significant immigrant populations compared to the high averages for the EU15.Â We considered the percentage of immigrant population by country, using data published by the Europäisches Migrationszentrum (EMZ).8Â The main reason for using this variable was to identify whether the presence of immigrants was above or below the regional average in countries where the ERPs has been able to convince more voters. 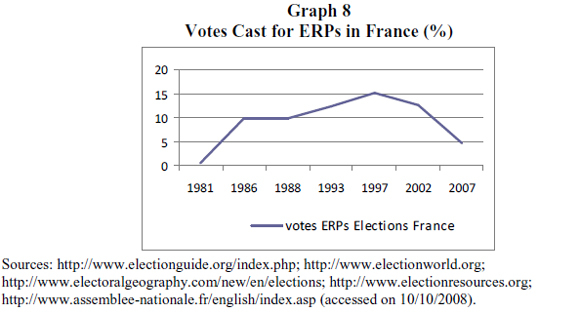 We believe that the data researched concerning the support for ERPs, following their appearance in the 1980s, associated to variables of representation, economic performance, victimization, and immigrant population, are fundamental in building a contribution to the debate concerning the yet little known reasons that have led voters to increasingly, although still in a minority, incline towards xenophobic political platforms. Knowing that the extreme rightist attitude also reflects resistance to European integration, the populist critique as to the lack of legitimacy of the integration process has been slowly gaining greater traction. As shown in Graph 17, the level of trust in European institutions has been lowering.Â Ireland, for example, one of the countries which displayed the least resistance to the European Constitution, along with Portugal and Spain in 2000 (Eurobarometer 65, 2000), recently rejected the Lisbon Treaty, which is nothing but a summarized and trimmed down version of the Constitutional Treaty. Dividing the EU15 countries into two groups, we submitted the data to a simple statistical test (test of means), with the objective of verifying which variables would produce an impact on the performance of ERPs in a comparative perspective. 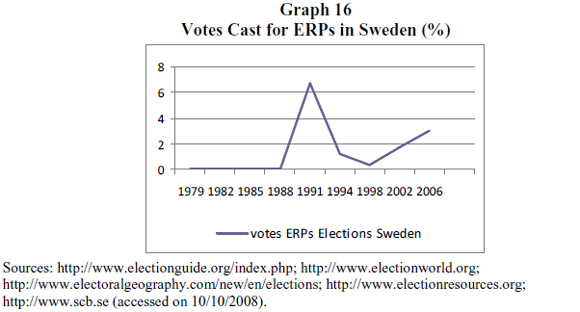 We selected data from 2005 for the test's variables, as it is considered an important year for the general increase in support for ERPs, as can be seen in Graph 1. Thus, group A comprises countries in which national societies have not been presenting electoral support for ERPs since 1980. In other words, these are the countries in which the mean of votes cast for the extreme right is "0" (see Table 1). Group B is comprised of countries whose national societies present, to a greater or lesser degree, electoral support for ERPs. Testing the means differentials found in each group, we expect to see that factors related to economic performance are not in fact fundamental in explaining differences in terms of support given by the national societies of the countries in group A when compared to those in group B. The test of means used9 is appropriate in responding the question of whether the means of each group of countries, as a result of the variables used, are statistically different. In other words, whether we are able to assert that countries with different levels of support for ERPs present results that are effectively divergent in relation to the variables of representation and to the economic and social variables used. As to the variables most commonly used by the literature on Euroscepticism (lack of confidence in the EU and against the European Constitution), we expect to see that group B in fact presents less trust in the EU and more resistance to reforms such as those contained in the European Constitution - in other words, general Euroscepticism. As to the violence variables, we expect to see that violence indicators have lowered to a lesser extent in countries whose electors show some support to ERPs. This is because votes expressing preference for agendas of intolerance have been generically associated to the perception that societies are at risk and criminality is a reflection of the non-inclusion of the xenophobic voter's unwanted immigrant. An additional consequence of social fragmentation and non-integration of immigrants is discrimination and the increase in "hate crimes", which are viewed as an exacerbated reaction of intolerance, rejection and discrimination. Hence, we expect to see more hate crimes in group B. According to the logic derived from what is already known concerning xenophobic behavior, we expect to see that the immigrant population in countries in which ERPs receive greater support will be higher, even despite the fact that Luxembourg, a country with a low level of support for ERPs and also a low rate of hate crimes, is also a country with an immigrant population well above the European average (approximately 37% of the population of Luxembourg is made up of immigrants). It is worthwhile emphasizing that, although the test of means method adopted is not a sophisticated statistical test, it is nonetheless a useful mathematical and statistical exercise, capable of substantiating arguments and supporting the hypothesis concerning the non-material reasons which explain the performance of ERPs. Thus, the objective of including a test of means, as presented in Table 2, is solely to add a useful descriptive device to the analysis, capable of more solidly providing evidence of the differences between the means of the groups of countries examined. For this reason the dependent variable of the test is voter support, even if in a minority, for ERPs in Western European countries. We define support as "the attitude of voting for ERPs", regardless of electoral support in terms of the acquisition of seats in national Parliaments. Indeed the very decision to call the Rome Treaty a "Constitution" is the most evident sign of the intention of carrying out an approximation between the process of integration which is being conducted by political elites and broader and conscious participation of European societies. Thus, the attitude of non-support for ratification of this treaty is strongly connected to the attitude of more generalized mistrust towards the EU. The second result refers to the variable of representation of the member countries in European institutions. The differences in means, in this case, are not statistically relevant, however, differently from what we expected, the presented results were positive. The group of countries whose electors have traditionally supported ERPs have more seats in the European Parliament and more votes in Council, and thus have at their disposal more tools to interfere in decisions concerning regional policies. As the changes in the number of seats and votes in the Council vary little, and as the data, in the case of the selected variable, varies more rarely than others, an econometric approach taking into account a longer temporal series would be more accurate, and on its turn would render the effects of this variable clearer. The difference of means for the economic variable unemployment was not statistically relevant, despite being positive. Unemployment has been strongly associated by several important studies to the growth of the extreme right. However, high unemployment, in most European countries, cannot be analyzed without considering the protection provided by the European welfare state. Thus, we considered the variable income distribution inequality possibly more important than the unemployment variable in this test, which does not take into account the "benefits" received by unemployed citizens, which vary among countries. The income distribution inequality presented a negative result, with a relevant statistical difference and high confidence level, close to 5%. The countries in group B presented means of unequal distribution of incomes significantly lower that those in group A, from 4.13% to 6.2%. This result suggests that societies least affected by social fragmentation caused by poor income distribution have voted more often for xenophobic parties in Western Europe. This contradicts the argument which associates social inequality to intolerant attitudes. Several variables related to violence were tested taking into account the generic associations xenophobic discourses typically make with respect to the issues of urban violence and in the test we came to a very suggestive result. In addition to the fact that violence indicators have been dropping all over Western Europe, as mentioned earlier, in the case of the countries of group B, robbery crimes dropped significantly in the last year considered by the European Crime and Safety Survey (EU ICS 2005). Furthermore, considering the indicators for the five years preceding the 2005 survey, the difference in terms of the reduction of robbery in groups A and B becomes extremely relevant. In other words, robbery crimes dropped more in countries belonging to group B with a maximally significant statistical difference (confidence level = 1). In other words, in group B, comprising societies which, even if only eventually and in minority, support ERPs and vote for xenophobic agendas, robbery crimes have decreased more significantly than in countries where there is no support for ERPs. Once again it is important to point out that the programs and discourses of ERP leaders associate inequality, unemployment and crime to the need to defend a xenophobic agenda. It is also curious to note that, although not statistically relevant, we can observe that, contrary to robbery crimes, the results are positive in the case of hate crimes. This means that there are more hate crimes in countries in group B than in countries in group A. However, although relatively high, the difference between the means is not significant enough statistically. Still, the observation is in line with the general arguments of this article. The results suggest, in sum, that the attitude of support for ERPs is more strongly related to lack of trust in the EU and, consequently, to the rejection of the idea of a European Constitution, as well as to the voter's perception that she is informed about the EU, than to the frustration or satisfaction as to the economic benefits that European integration could be represented to have brought. This suggests that the defense of values, beliefs and identities prevails over the material advantages economic integration is capable of generating. Some differences of means were not statistically relevant, as was the case with the variables of representation. 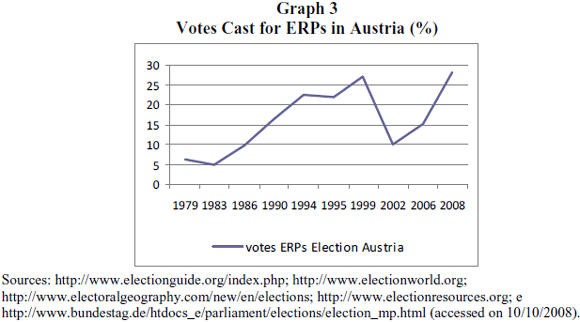 These specifically deserve more careful treatment, which would probably depend on an investigation focusing on the correlation of representation variables and its effects on a temporal series capable of aggregating more precisely information on the growth of votes for ERPs and the reforms of the Council of Ministries and the European Parliament in the needed redistribution of seat after each round of EU expansion. The results found here help in understanding countries such as Greece and Italy, which undoubtedly benefit from economic integration at the same time their societies support ERPs poised against political integration. On the other hand, countries such as the United Kingdom, which have historically been show greater resistance towards integration, do not have a significant tradition of support for ERPs. It is possible to observe that the UK has an extremely low - in fact, the lowest - level of social perception of information about the EU (3.7% of those surveyed in the UK consider to know something about the EU) (Eurobarometer 64, 2005), as if indifference to the policies of the EU could spare British citizens from the talons of European institutions. This conclusion can only by the product of lack of information concerning how much British institutions are already currently intertwined with European counterparts and that the non-adoption of the Euro, for example, is not a free pass for disobedience, for example, of the decisions made by the European Court of Justice. Those societies which perceive the effective powers bestowed upon the new European arenas of political competition and bargaining are the same which show greater resentment towards the cultural and national homogenization which comes with economic integration. This suggests that voters who are more conscious of the powers of European institutions and their consequences can also be those who fear them most. The comprehension of the establishment of a supranational instance in which political decisions are made and that are capable of interfering with the autonomy of the national Executive, Legislative and Judiciary branches of power does not seem indifferent behavior towards the process of social integration. The analysis of this data contributes towards confirming other findings available in the literature (Ignazi, 1996; 2003; Midde, 2007; Kitschelt, 1995; Betx, 1994) according to which the preference for intolerance is not based on the perception that there are true economic or social losses as a result of regional integration. The main focus of concerns and claims made within the new political division is identity. Ultimately, the capacity to interfere in the supranational decision making process and the awareness of the limits of this capacity are thus an important variable to achieve a better understanding of xenophobic behavior in Europe. These conclusions are in accordance with the changing profile of the extreme rightist voter: younger and more educated, in contrast to the traditional profile associated to class divisions. If there is anything new about as to the intolerant or xenophobic attitudes in relation to situations of intolerance in the past of European history, it is in the form or organization and the articulation of non-democratic ideas. The vote for the extreme right has also been interpreted by and large as a protest vote cast by electors who are suspicious or who have lost belief in local and national politicians and who, naturally would not support the creation of more representative or decision-making political institutions - which is the case of European institutions. Thus, the unusual novelty is that the outcome has been the strengthening of political parties which play according to the rules of the democratic game in order to gain legitimacy to call for the implementation of agendas which seek to restrict the scope of the very same democratic game they have been benefitting from for the last quarter of a century. BETZ, Hans-Georg. (1994), Radical Right-Wing Populism in Western Europe. New York, St. Martin's Press. DE MASTER, Sara e ROY, Michael Le. (2000), "Xenophobia and the European Union". Comparative Politics, vol. 32, no 4, pp. 419-436. IGNAZI, Piero. (1996), "The Intellectual Basis of Right-Wing Anti-Partytism". European Journal of Political Research, vol. 29, no 3, pp. 279-296. ___. (2003), Extreme Right Parties in Western Europe. Oxford, Oxford University Press. KITSCHELT, Herbert. (1988), "Left-Libertarian Parties: Explaining Innovation in Competitive Party". World Politics, vol. 40, no 2, pp. 194-234. ___. (1994), The Transformation of European Social Democracy. New York, Cambridge University Press. ___. (1995), The Radical Right in Western Europe: A Comparative Analysis. Michigan, University of Michigan Press. MARKS, Gary, WILSON, Carole e RAY, Leonard. (2002), "National Political Parties and European Integration". American Journal of Political Science, vol. 46, no 3, pp. 585-594. MARKS, Gary et alii. (2006), "Party Competition and European Integration in East and West. Different Structure, Same Causality". Comparative Political Studies, vol. 39, no 2, pp. 155-175. MUDDE, Cas. (1996), "The War of Words Defining the Extreme Right Party Family". West European Politics, vol. 19, no 2, pp. 225-248. ___. (2007), Populist Radical Right Parties in Europe. New York, Cambridge University Press. POGUNTKE, Thomas e SCARROW, Susan. (1996), "The Politics of Anti-Party Sentiment: Introduction". European Journal of Political Research, vol. 29, no 3, pp. 257-262. TAGGART, Paul. (1998), "A Touchstone of Dissent: Euroscepticism in Contemporary Western European Party Systems". European Journal of Political Research, vol. 33, no 3, pp. 363-388. VAN DIJK, Jan et alii. (2005), "The Burden of Crime in the EU Research Report". A Comparative Analysis of the European Survey of Crime and Safety. The EU International Crime Survey, EU ICS. VEUGELERS, John e MAGNAN, André. (2005), "Conditions of Far-Right Strength in Contemporary Western Europe: An Application of Kitschelt's Theory". European Journal of Political Research, vol. 44, no 6, pp. 837-860. VEUGELERS, John e CHIARINI, Roberto. (2002), "The Far Right in France and Italy: Nativist Politics and Anti-Facism", in M. Schain, A. Zolberg e P. Hossay (eds. ), Shadows over Europe: The Development and Impact of the Extreme Right in Western Europe. New York, Palgrave, pp. 83-103. * This article is the partial result of an ongoing research agenda. From the beginning of the project until the final version, this study has been presented in several conferences and public debates: the conference of the European Consortium for Political Research (ECPR), in Pisa (September 2007); the Midwest Political Science Association (MPSA) conference in Chicago (April 2008) and the 6th Meeting of the Brazilian Political Science Association (ABCP) in Campinas (July 2008) The final results presented here also owe much to commentators who read drafts, discussed problems, made critiques and provided encouragement. Thus I would like to thank the debaters of these conferences, the anonymous reviewers of DADOS, which always improve and especially, Carlos Pereira, not only for being a reader and interlocutor but also for his unconditional support. 1 The data was retrieved from the official websites of the national Parliaments of each country. Other websites were also used: http://www.electionworld.org; http://www.electoralgeography.com/new/en/elections; http://www.electionresources.org; http://www.electionguide.org/index.phpÂ (accessed on 10/10/2008). 2 The data of the elections and of votes cast for each political party are made available by the official bodies of each national Parliament. Therefore this article did not rely on a single source. Each source was consulted individually to retrieve the data by election and of the votes cast for each party in each country. 3 Spain and France have similar proportions of immigrant populations (around 5.5%). However, in Spain there is no tradition of support for xenophobic political parties as there is in France. 4 In the years in which there were no national elections, the percentages of the last election were reiterated in order to allow for an annual count, taking into account that national election in the surveyed countries researched are not held on the same years. This was the solution found in order to account for the varying electoral intervals, as well as, in some cases, government terms. 5 The graphs were constructed based on the results of the research on the vote percentages in each national election in each country and according to extreme rightist political parties consulted in the official websites of the national Parliaments of the investigated countries and also based on data retrieved from www.electionworld.org (the results are summarized and present in the Table presented in the Appendix). 6 The criterion for the tallying of the average of votes cast for each country during the period investigated was the same as the one used for Graph 1, namely, the repetition of percentages during interval years. 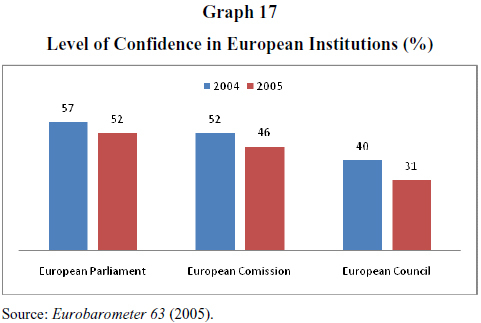 7 The data used for the measurement of the variables against the European Constitution and lack of confidence in the EU were retrieved from the Eurobarometer 63 (2005); for information on European institutions, Eurobarometer 64 (2005) was used. 8 Available at www.Emz-berlin.de (accessed 10/08/2008). 9 This is a Z test and the formula used was: Z = (X1 - X2) - (m1 - m2) / s x1 - x2. 10 This is because radical leftist parties, as opposed to radical rightist parties, have been progressively losing votes in Western Europe. 11 Naturally, this does not mean that things will be easier on blue-collar workers, since it is in these countries' interest to regulate immigration, and the changes in regional parties show that the selection of immigrants has been more stringent.